Fliers Allow Passage Through DUI Checkpoints, But Are They Really Protecting the Innocent? Our Los Angeles DUI attorneys have been fascinated by a compelling story out of Florida. Warren Redlich, a DUI attorney in Boca Raton, started a trend that’s attracted crazy amounts of media attention. He provides fliers for individuals to use when they pull up to DUI checkpoints. Many videos on YouTube are proving that his method works. Drivers who present the necessary information drive beyond the checkpoints without the usual interrogation. The signs read: “I remain silent. No searches. I want my lawyer.” State specific statutes regarding DUI laws follow those words. 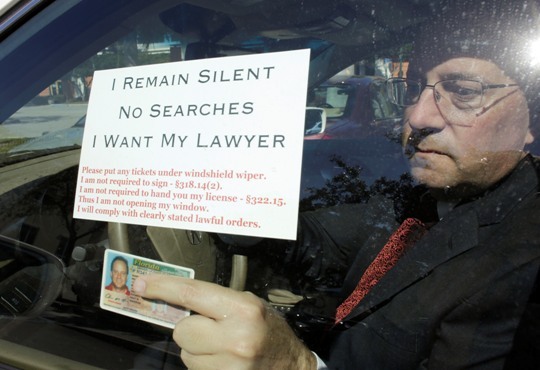 Drivers leave their car windows rolled up and display their fliers and necessary identification until police motion them forward in the line. Redlich believes the method will prevent innocent individuals from being wrongly arrested. Police departments believe in the constitutionality of DUI checkpoints and procedures, citing a Supreme Court ruling from 1990. Redlich does not recommend using the flier technique in states other than Florida and New York without first consulting an attorney admitted in that state. The controversial method highlights the tendency of people to form preconceived notions based on stereotypes of DUI lawyers and their clients. A common misconception holds that DUI lawyers work towards reducing sentencing and case dismissals at any cost. Similarly, people assume that an arrest indicates the presence of enough evidence for a conviction. In reality, people only hear about extreme and high-profile cases. These depictions of the DUI space skew the public’s understanding of the process. DUI defense attorneys have a responsibility to protect the rights of every individual who faces charges. Their duty calls for impartiality to help clients present the most accurate and fair case in court. Innocent individuals face public scrutiny from the moment of arrest. Local media reports only reflect the names and information from the police department. This information sometimes builds a case against individuals before the prosecution starts and carries on long after exoneration has been granted. The uphill battle for the innocent makes the need for solutions like Redlich’s fliers understandable and justified. However, the Los Angeles DUI community does not recommend using fliers to gain passage through DUI checkpoints without consulting an attorney. Do you need help defending against a drug or DUI charge? Michael Kraut of Los Angeles’s Kraut Law Group is a trustworthy, highly qualified former prosecutor. Call a DUI attorney today to strategize for your defense seriously.